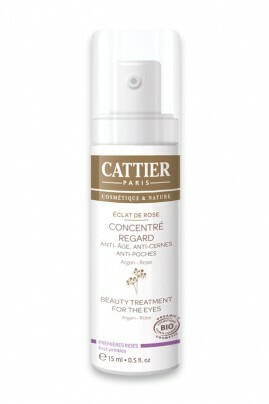 Cattier Organic Eye Contour Care "Eclat de Rose" is an anti-wrinkle, anti puffiness and anti dark circles concentrated treatment. Organic Argan oil which is packed with Vitamin E, encourages cellular energy : it intensely moisturises* the epidermis and strengthens its elasticity. The Black Wheat wax, rich in phytosterols and unsaturated fatty acids, reduces puffiness under the eyes. Red Alga extract completes the treatment by activating microcirculation and relieving congestion whilst Green Alga extract reduces the colour of dark circles and increases luminosity. Butterfly Lavender extract fights against expression wrinkles thanks to its smoothing properties. Organic Rose water soothes and refreshes the skin. 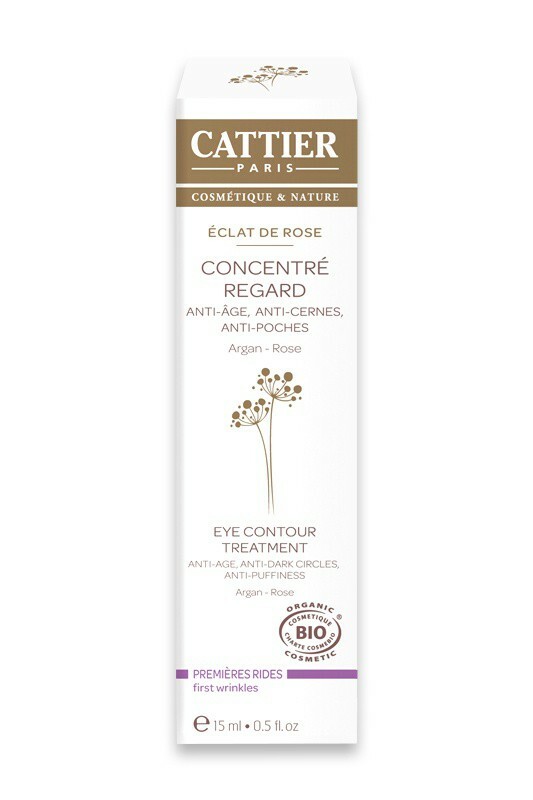 Cattier Organic Eye Contour Care "Eclat de Rose" tones the area around the eyes and alleviates bags under the eyes and fine lines. The eyes are more luminous and the epidermis is toned. Morning and evening, apply Cattier Organic Eye Contour Care "Eclat de Rose" on cleansed and dried skin by massaging into the area around the eyes from the interior towards the exterior by gently patting with the fingertips. Complete the moisturising process with Cattier Organic Moisturizing Cream "Elixir Végétal" or Cattier Organic Nourrishing Cream "Secret Botanique". Suitable for all skin types. J'aime ce produit la texture se fond bien sur le contour des yeux, il a considérablement diminué mes petites poches. Je le rachèterai. Texture très agréable à appliquer. Ne colle pas, et rend le contour de l'oeil bien hydraté, souple.